I found it interesting too that Marie doesn’t suggest you try on your clothes or consider if they suit you etc. I suppose you instinctively know all that anyway at some level so it just slows you down. I was interested by WA but there are so many steps and I feel that would lead to over-thinking, yes. Interested to see how you get on with it. Katie this is ringing very true for me, with reference to getting rid of self sewn garments, always more difficult I think! I have just ordered the book, my closet is groaning and is well overdue a clearout for spring. I agree with you too on the hanging i much prefer to see what i have especially when rushing to dress on a busy morning! I will let you know how I get on…..
Good luck, it’s definitely a worthwhile activity! What a great approach. I’m really terrible at getting rid of clothes but I know I have loads that I never wear because I’m just not that inspired by them any more. 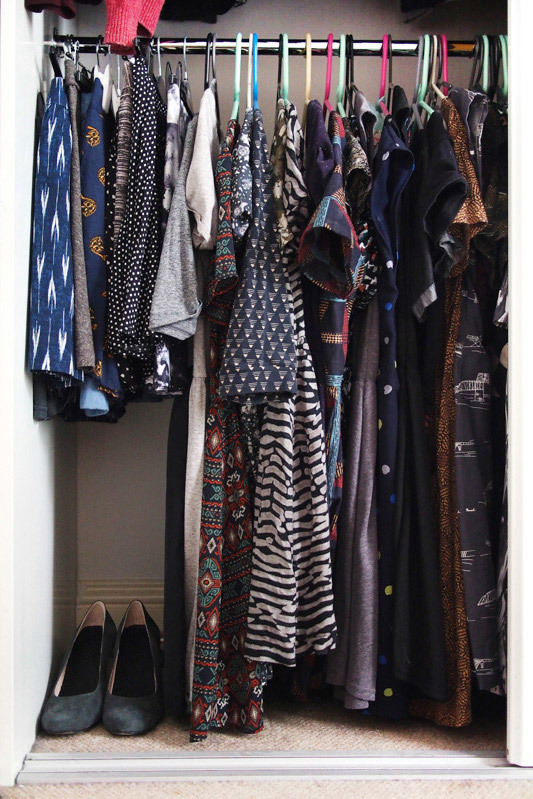 Your wardrobe looks so neat now! We’ve been decluttering the whole house over the last 6 weeks. For clothes I took a 3 pass approach… first pass is to remove tired, old clothes, second pass is to remove ill fitting and the third pass, a few weeks after the other two, was to remove all the ‘maybe’ items that haven’t been worn. I found no difference in RTW and handmade but my husband found it really difficult to get rid of anything that was a present and/or handmade. I kept telling him I could make a new one (but better where my skills have improved or a pattern that obviously needs adjustments). I’ll tell him to thank his clothes for the joy they have brought him but it’s time to let go! I’ve moved onto other things in the flat today, it’s definitely so worth doing. Hard work though! So brave. I need to do this, for my children as well as myself. We are all drowning in clothes. Never come across this before either. I feel like I spend half of my life decluttering! Probably because I totally don’t trust my husband: he’s far too good at it and there would be nothing left in my children’s rooms ;-) I’ll doubtless be having another attempt this half-term. I’ll keep this method in mind, thanks! 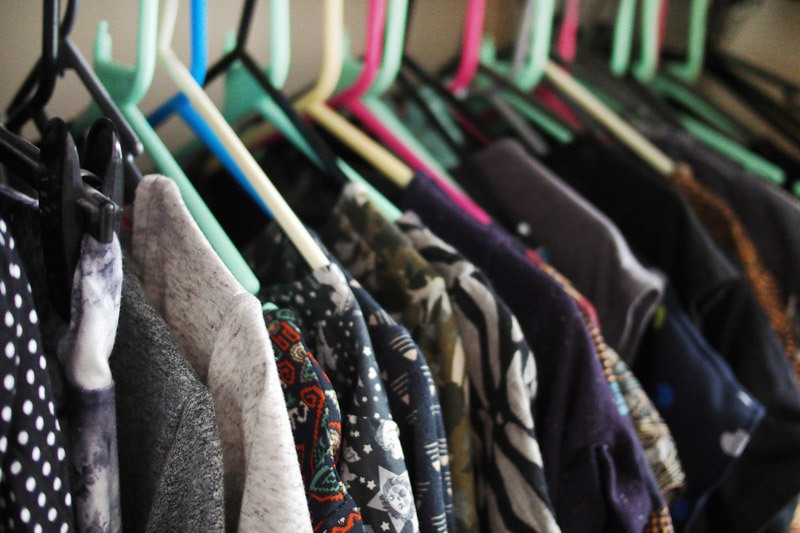 There’s nothing like looking at your freshly cleansed closet and only seeing pieces you love! I’m glad you found the book useful. 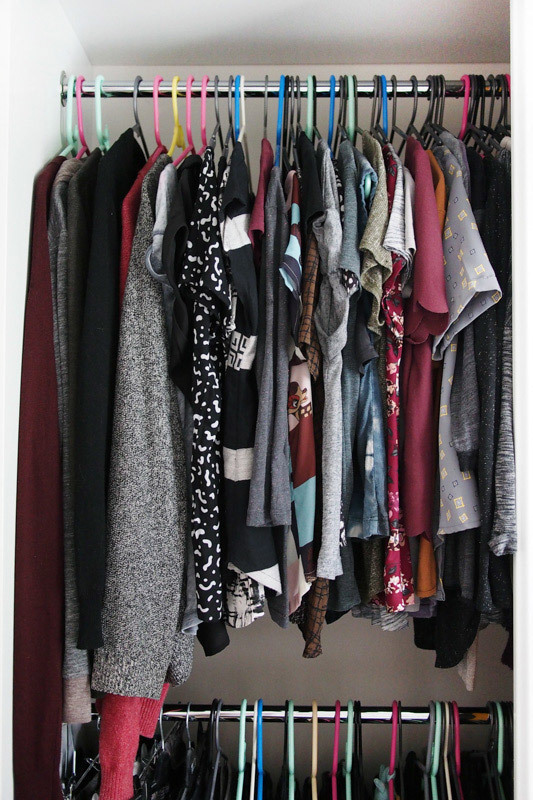 I finished my clothing sort a couple of months ago (I think?) and I can say that I’m still folding / putting away my clothes every night and handling my laundry promptly. I was only cautiously optimistic when I read that her clients don’t relapse but when everything has a home, it’s harder to make excuses! It’s still such a novelty, I love getting dressed and putting my stuff away! Funny how a lot of sewists are drawn to it – I guess we accumulate a lot of stuff and have trouble throwing away! Nice work there Katie! 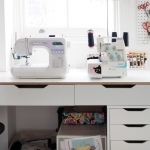 It must feel nice having your new sewing room and now a de-cluttered wardrobe. So much easier to plan your new-makes for 2015 now! I am well over-due for a clothes de-clutter. 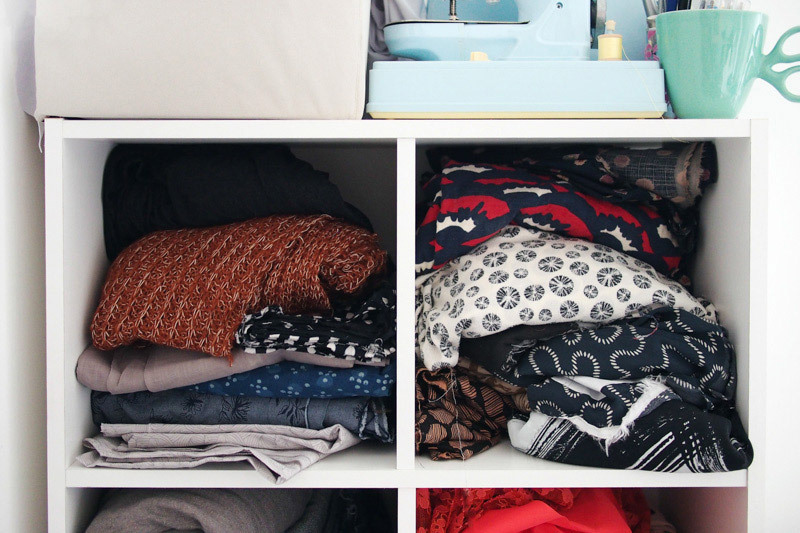 I have been doing little amounts fairly regularly but think I need a more rigorous approach – like you have done to get rid of un-wanted / tired / un-worn clothing. I do intend to pare back my sewing stuff a lot, and only keep what I need for my next few planned projects. I need to slow down sewing so I don’t end up with a bursting wardrobe again…! Interesting! I recently posted on a similar theme after sorting out our bed linen collection (http://www.auldfashioned.blogspot.co.uk/2015/02/more-or-less-overcoming-stuffocation.html) and working from a ‘no more than 4’ basis rather than can I let go of this when it was given to me/could be made into something else/etc etc? 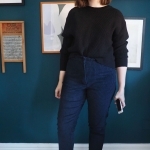 I am planning to work on my clothes next (we are doing a bedroom makeover, so whittling down is all good) and I was thinking of using ‘how many shirts/tops/skirts do I need (or could I manage with)?’ and let that guide my purging decisions, rather than the do I like it/does it fit question. I have already concluded that in order for the number approach to work, that will mean that I will really have to like things for them to stay. My clothes will have to work harder because I’ll have fewer of them. And, like you I suspect I will end up with a few gaps in my wardrobe that need to be filled. Stuffocation is a great word! I threw out a load of old pillows and bedding as well. A number approach is interesting – I did count how much I had in each clothing category after I was done and it feels like a good amount, so maybe keeping at this equilibrium would be a good idea. I’ve been doing the same! The book seems quite ruthless at first, but as I begun to sift through my wardrobe I began to really get it. I think I’ll need a second pass though… even though I parted with quite a bit I know more can go. The rest of the categories will be far easier to sort! It’s absolutely ruthless! 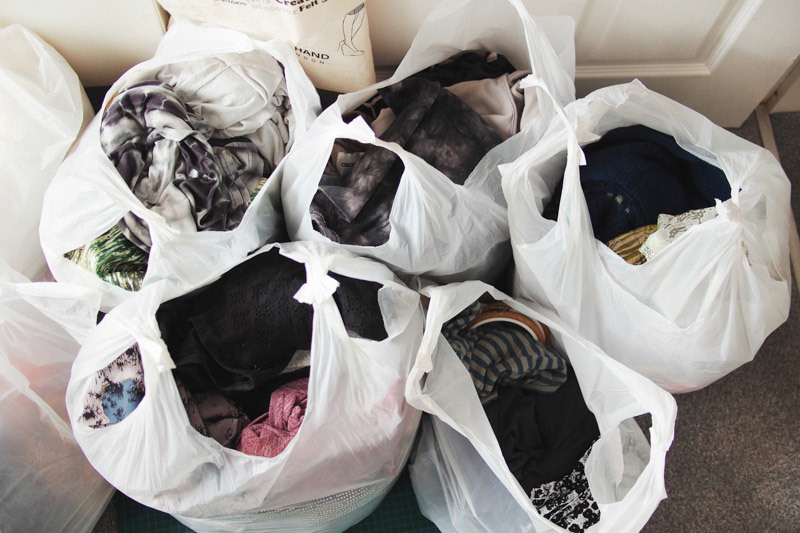 I’m having pangs for a few things I discarded… they’re still in bags for the charity shop to pick up. I wonder how Marie feels about digging something back out again… however I reckon a few more things will go shortly too. This was such an interesting read. I’m feeling overwhelmed by trying to keep my tiny house neat and feel like a lot of my stuff needs to go. I tend to fairly ruthlessly cull my wardrobe every season, but as I refine my preferences and sew new garments, I am definitely going to give this a try. I like the (albeit cheesy) idea of thanking the clothes. Clothes with memories are always the trickiest for me to let go of! For sure. I have a couple of very old t-shirts that I couldn’t bear to throw out even though I don’t wear them any more. They still spark joy though, so they pass the test! I’m reading the KonMari book at the moment too, and have been sorting out my wardrobe over the weekend. 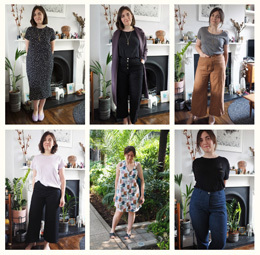 I’m finding culling the wardrobe with the “spark of joy” test much easier than in the past, when I’ve tried to be sensible about what to keep and leave – there are some garments that I don’t wear much but love, so I think they deserve to stay. There are others that are eminently practical but don’t really feel like me, so it makes sense to let them go. Yeah, it’s really interesting that practicality or if it suits you etc isn’t important in this method. I think that’s what freed me up to throw out things I hadn’t considered chucking before. I haven’t read the Kondo book, but I’ve read several blog posts about it. I love that it doesn’ t seem to be guilt inducing. I agree that clothes are easier to sort through than books as I cannot get rid of books. I do sort through clothes twice a year, and I put away the off-season clothes. I wonder why Marie Kondo says you shouldn’t? It works for me. When I do the switch, I rediscover all the things I’d put away and it’s almost as if I get to reinvent my wardrobe twice a year. The one thing I struggle with though is scarves, because I have a good number of scarves that belonged to my grandmother. They are really gorgeous, but not my style, but I can’t seem to part with them. I’m not so attached to books, I read mostly on kindle now. The ones I find hard to throw away are cookbooks! I think I agree with you about seasonal clothes. My off-season stuff lives in a drawer under the bed, and I haven’t put all of my summer stuff into my main wardrobe just yet. I don’t really see the point as they only see the light for holidays and maybe two weeks of the year. So I think I’ll cheat and leave some under the bed, but do an edit so I’m not hauling things out that I don’t like each season. If the scarves still spark joy and remind you of your grandmother, you should keep them! I kept a couple of things that remind me of trips and things, even though I don’t wear them any more they still make me happy. Thanks for this post Katie. I try to clear out my wardrobe regularly and it is nice to read about different methods. 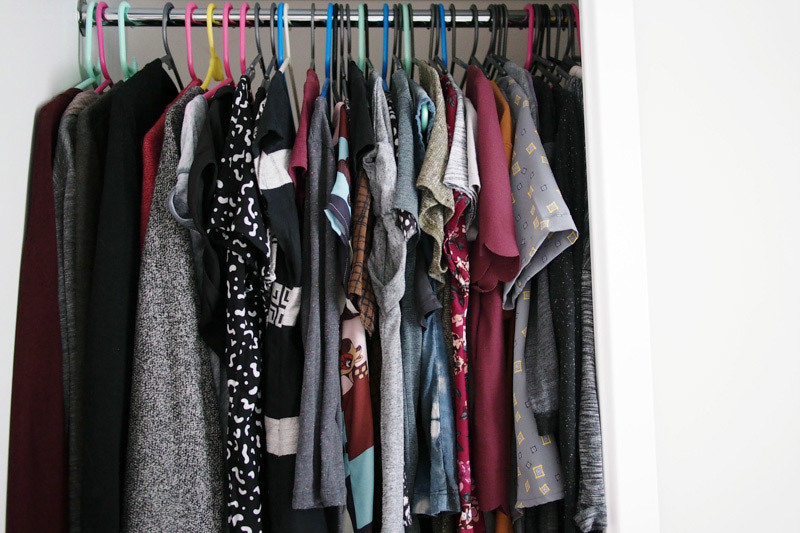 I find my wardrobe has less and less clothes and it makes it so much easier to choose clothes in the morning. Whenever I feel I don’t have anything to wear I know it is time for another clear out. I do love the idea of less stuff and the only place I’m really failing is the wardrobe! It’s great that it’s been a useful exercise for so many people…..
I’m going to be very practical and boring though and ask what the authors view is on the mundane and boring things like the thermals, the singlets and the beat up old clothes we wear doing housework, renovations, gardening and to the gym. Isn’t it wasteful to some degree to get rid of such things that we all need, but sure as heck don’t spark joy?! Or is her point to only have a few such things? Don’t get me wrong I’m not being critical in any way but I know for a fact I’ve a pared down shelf of things I don’t love and would love to chuck but I know I will need and wear regularly in the unglamorous roughage of my life…..
Good point, and she sort of does address this. Basically anything that’s indispensably useful to your lifestyle does spark joy in its own way because it’s necessary to own it in order to carry on doing the things you like/need to do. That’s why I found it a bit more useful to expand the sparking joy question in my head to allow for those kinds of answers – those things aren’t a burden to own since you need them to maintain your lifestyle, so they can stay. np! The book has definitely changed my way of thinking about the stuff I own, and realising how much of it really does drag down your surroundings and hence mood. I’d love to reach the point where I only own things I love and/or support my lifestyle – that’s the end goal! 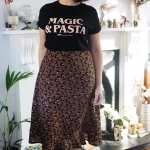 Ive only been sewing my clothes for 18 months or so… so I’m just getting round to the point where I might need to chuck out some handmade items and it is so much harder! However I did a thorough wardrobe sweep a while back and have now found that I have very few things to wear, great excuse to sew lots! It’ll be great to slowly go through my apartment and reorganize while downsizing. :) Thanks for the inspirational post! oh, wow. I should do this. I am always really battling with myself, because I love having stuff, but I desperately want to live a more portable, simpler lifestyle. The joy-sparking question is a scary one because I know a lot of the stuff that I have does not spark joy, but I still want to keep it! Silly, I know… In any case I am moving out of a house and into an apartment fairly soon so my life is ripe for a tidy. I am always clearing out my closet but if I only kept the joyful things it would be much smaller. To motivate me to have a big clear out, I find nothing better than watching an episode of ‘Hoarders’! To see mountains of clothes and other possessions in other people’s homes really drives me to have regular clear outs. I have been a magazine/book/paper/clothes hoarder (though not extreme) in the past but now I keep this well under control. As I make most of my own clothes, I find it extremely difficult to let these go as there is more of an attachment, but I would rather give these to friends who appreciate them more. Its much easier to give away shop bought clothes. “Hoarders” can make you realize just how much unnecessary stuff you’re living with……and taking care of which is time that could be spent on more joyful pursuits. This is such a great way to reframe the clearing out discussion! I will definitely check out this book- it sounds really interesting! I struggle to keep things de-cluttered since we’re apartment-dwellers… it was much easier when I didn’t have any real hobbies! And I never know what to do with the things that I don’t use very often (like, say, a set of screwdrivers) but don’t want to have to pay to replace if I chuck them and end up needing them later! Guess I’ll have to read the book! Thanks for the rec! Oh! I also wanted to say that it’s really not very hard for me to give away handmades. Once I realized that, for me, it’s way sadder for something that I spent a lot of time and energy on to be unworn and unloved, I found it to be kind of a happy thing to give them away. Recently I sold quite a few handmades to a secondhand store in my neighborhood, and the buyer was really impressed by my sewing. She’d worked in costuming and was really excited to check out how I’d made different things and what techniques I’d used. I was so pleased that she thought other people would want to wear my stuff! I feel the same! I was in our local charity shop the other day and saw some of my handmades on the rail, it was a nice feeling! To be honest I’m still balling my socks, I need to try her folding method out… I had a MUCH needed undies and pyjama throw-out, was definitely hoarding a load of comfy-but-scuzzy things in there. oh wow, i’m reading the exact same book!! but sadly i’m LOLING through the book because i aint got jackshit (the curse of being young n broke) but its the first time i’m living on my own and i just need to dust and vacuum and mop more (yay:|) so it hasn’t really helped. i just stick to my newly minted cleaning schedule which has improved my surroundings. Haha, I bet cleaning is easier when you have fewer possessions though. I usually have to spend ages tidying up THEN clean and it takes forever. Not strictly sewing related but certainly relevant. Your added questions definitely make sense and I may try using your three questions in an upcoming effort to cull items myself. I’d be interested in hearing about how the rest of the types of items go too. I’m doing the sewing room this week! Throwing out fabric and notions definitely seems harder than clothing. I recently moved temporarily for an internship for just six months and had to do something similar, although I hadn’t heard about this method before. I could only pack one box with clothes, so I really had to think about which garments I actually wear and like wearing! Now my wardrobe is small but very functioning, with colours that goes together and garments that are easily combined. Feels great, and it’s easier now to plan upcoming sewing projects that fits well into it! Thanks for posting this! I haven’t heard about the “konmari” method before but I seriously needed to. I’m such a pack rat, I get anxious even thinking about parting with my stuff, especially my handmade clothing even if it doesnt get worn often. I’m definitely going to take a look through this book and try to go through my clothes. Hope it helps you! I kind of like having stuff around me too, but it’s definitely freeing to learn to let go a bit. I’m reading her book now and got rid of 75 percent of my wardrobe easily. But, I can’t bear to let go of about three vintage dresses. Maybe next years purge? 75% is good going, so I think you can hold onto three dresses for a bit longer! Yes! I read the book too :) My closet is now completely decluttered! Also did my book case! It’s such a great feeling isn’t it?! I just read the book and while I think she’s crazy obsessed, I so want to be like her! hahaha. I went through some clothes while I was packing (to move!) this week and got rid of 3 bags already. When I actually sit down to do the method I feel like it’ll be awesome. I have a ton of clothes that are too small that I’ve been keeping for years until I reach the magic size where I can wear them again and I just realized that I feel terrible every time I look into my closet because I can’t even fit into most of them. My husband says I shouldn’t throw them out due to the replenishment cost, but I feel like I emotionally need to let them go! Anyone else ever deal with that? I would definitely throw those out, Jessica! It would be intresting to read someone elses thoughts about that about. And does your feeling last a few months after the cleanout? It’s definitely trickled down to my fabric and haberdashery stash! Fabric and wardrobe are totally linked for me since I aim to wear everything I sew, so it’s definitely affected my sewing choices as well. A few months on I’m very much still sticking to it – it’s sort of easy when you have the nice calm feeling that everything’s in order.